The Common Swift is a common breeding bird in Khar'kov. It builds nests in holes in walls and under roofs. Observations were made in the central part and in the north-eastern part of Khar'kov from 1992 to 2001. In the center, there are 5 and 7 storey buildings, in the NE part there are newer 9 and 16 storey buildings. 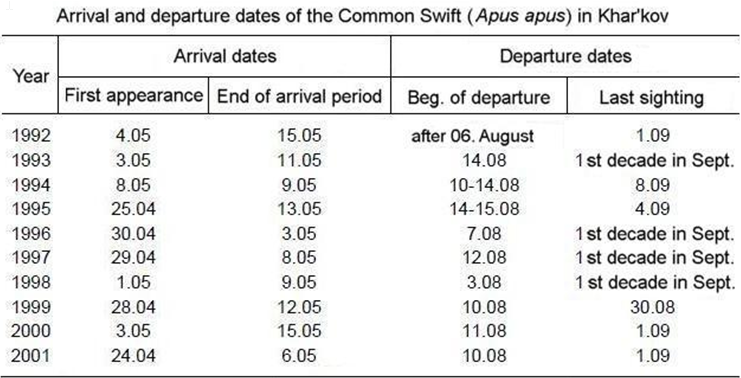 In some years the majority of Swifts leave immediately after rainy, cloudy days in mid August, as for example during 1993 and 1996.